Currently, Cat Mueller is exploring facets of text, imagery, irony, identity, politics, history, and concealing-and-revealing. Mueller was initially drawn to camo fabrics because of the loud kitsch nature of camo fashion accessories. This fascination led to deeper research into the origins of camouflage, which was pioneered by Op artists who experimented with using patterning to disrupt the reading of a silhouette, whether that of a person, ship or tank. 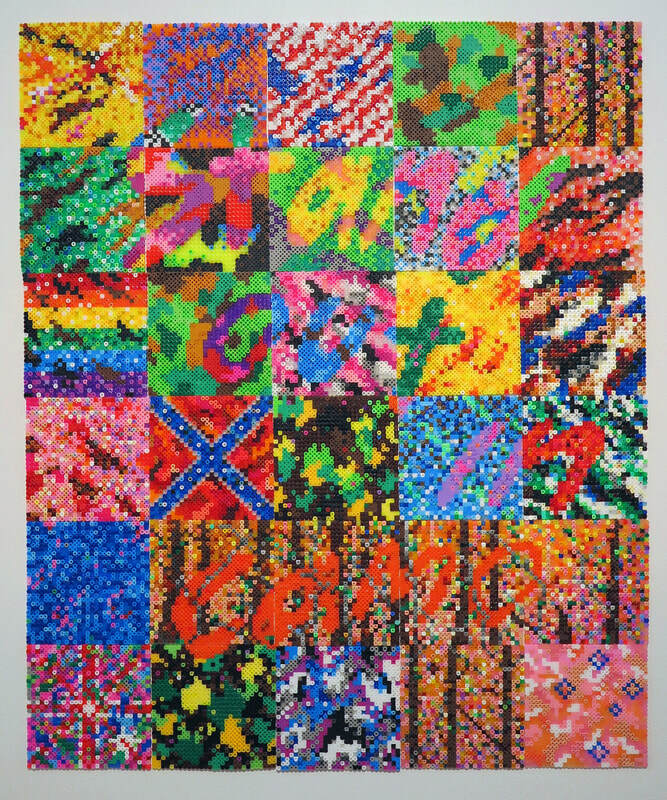 Consisting of HAMA beaded blocks, Mueller’s drawing creates a patchwork of the many evocations of camo whether practical, historically symbolic or light-hearted. Several of the blocks are created in the style of fashion fabrics: the bad, the sad and the fab that sit alongside official military issue camouflages like the Aussie ‘jelly bean.’ Text constructed with beaded pixels and camouflaged within the patterning can be deciphered at a distance. The hollow nature of the beads references camouflage military netting draped over shelters in the field that dapple light and vision. Yet the beads, a craft material enjoyed by primary school children everywhere, speak to a sense of innocence perhaps similar to that experienced by a pre-deployment solider. While the drawing references the traditional use of camouflage in warfare, survival techniques and hunting, it also addresses its role in the expression of patriotism, pride, glory, masculinity, remembrance, freedom and oppression —aspects strongly embraced by the American psyche. As a dual Australian-US citizen, with a voyage to the motherland fresh in her mind, Mueller’s research took a particular focus on camouflage’s place in Americana: the South, slavery, bigotry and military-centric culture.